Williamson is invited as a witness testifying to Utah’s early intervention program, HomeWorks, which uses evidenced-based strategies to keep families safely together and reduce placements in foster care. She will also advise on how federal funding reform can support in-home services. 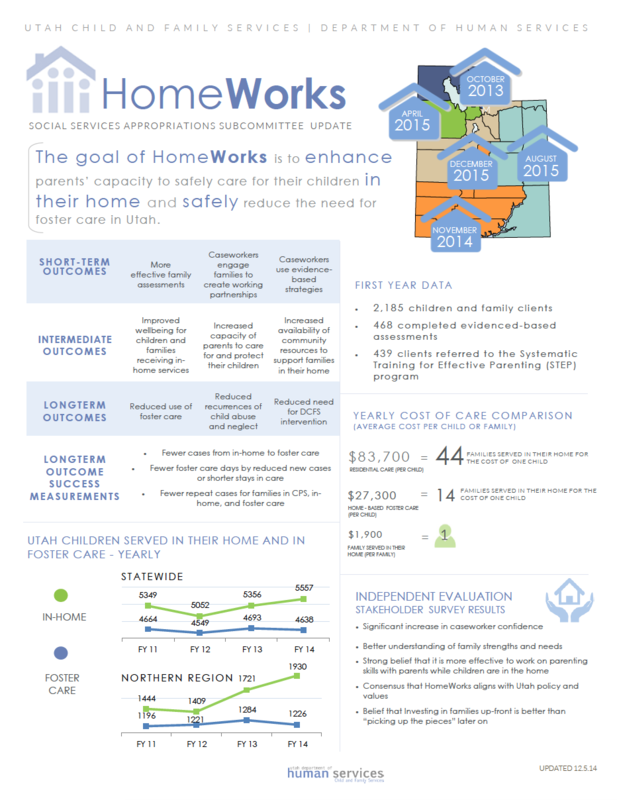 HomeWorks started in 2013 when Utah received a federal Title VI-E waiver to allow funding previously restricted to caring for children only out of their homes to be used to safely support children and families within their homes. See Utah’s Title VI-E funding reform fact sheet here: Finance Reform Doc_5.14.15. Utah already has one of the lowest rates of children entering foster care in the nation, despite having the highest number of children per capita. Now, it is gaining national attention for its family-based, in-home vision. Donna Butts | Executive director of Generations United from Washington, D.C. The hearing will be broadcast live over the committee’s website.